The internationally acclaimed artist Cerith Wyn Evans today unveiled a major new neon sculpture at National Museum Cardiff. The work, Radiant Fold (…the Illuminating Gas) (2017/18), has been created specifically for Amgueddfa Cymru – National Museum Wales and is the second donation made through the Contemporary Art Society’s Great Works scheme. Radiant Fold (…the Illuminating Gas) draws inspiration from the mysterious forms in Marcel Duchamp’s iconic work The Bride Stripped Bare by Her Bachelors, Even (1915-23). Three vast discs in bright white neon recreate the forms of Duchamp’s original into three-dimensional and multi-dimensional objects. Suspended from the ceiling at a skewed angle and developed with reference to the architecture and history of the museum, the work imposes a foreshortened perspective, evoking unfamiliar registers of perception and creating a rupture in the visual field. The Great Works scheme, generously supported by the Sfumato Foundation, aims to tackle the absence in UK museums of works by major British artists over the last 20 years. 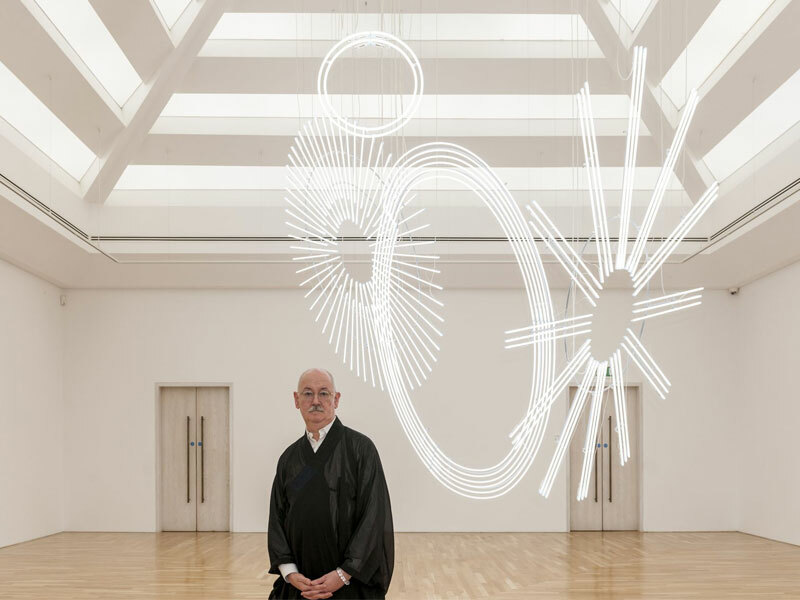 This will be the first large-scale neon sculpture by Cerith Wyn Evans placed in a UK museum collection and Amgueddfa Cymru is significant to the artist as one of the first places he experienced art as a child. Last year the first acquisition made through the Great Works scheme was a major new painting by Glenn Brown for the Laing Art Gallery in Newcastle. This new work will go on display in Gallery 24 from 10 March to 2 September 2018. For over 100 years the Contemporary Art Society has continually channelled philanthropic support of contemporary art to museums across the UK. In addition to landmark gifts to Tate, that included the first Picasso, Matisse, Anthony Caro and Damien Hirst to enter a UK public collection, the Contemporary Art Society has a track record of substantial support to regional museums, including the first work by Francis Bacon to Huddersfield in 1952, an installation by Olafur Eliasson to Eastbourne in 2003 a piece by Kader Attia for Middlesbrough Institute of Modern Art in 2016 and most recently an installation by Dineo Seshee Bopape to the Towner Gallery in Eastbourne in 2017. The National Museum Wales has also received a number of significant gifts from the CAS since the organisation was established in 1910, including works, amongst others, by Andrea Büttner, Patrick Caulfield, Henri Gaudier-Brzeska, Duncan Grant, Patrick Heron, John Hoyland and Joan Miró.